Krystal Kelly: Get a Real Job! February 2013 - I started taking riding lessons when I was nine years old, however, growing up in California made horseback riding an expensive endeavor - one that my parents could not afford. So I worked hard to muck stalls and do odd jobs to pay for my riding lesson every other weekend. Hard work at various stables and years of saving every penny finally paid off the day I was able to buy my very own horse at the age of fifteen! Although I was naturally talented when it came to horses, no matter how many horse jobs I worked - my dream of being a professional show jumping rider seemed a distant goal. Many of my own family members often discouraged me from pursuing a career with horses, preaching to me instead to follow in their footsteps and "get a REAL job!" Despite my lack of support, horse-related injuries, lack of finances, and the traumatic death of my beloved horse, I was determined more than ever to somehow, against all odds, make it to the big leagues. That's when I decided to enroll in the Riding Masters program at Meredith Manor International Equestrian Centre to jump start my career. My first day of school at Meredith Manor, my teacher asked my fellow first quarter students and me to make a list of our top ten goals for the future. When each of us shared our goals, many were happy to voice their dreams of starting a family, having a house with a white-picket fence and owning their own riding stables. I didn’t hesitate to announce my top two dreams: to be an Olympic show jumping rider and to work internationally with horses. Nobody believed I could do it. My time at the Manor was not easy. 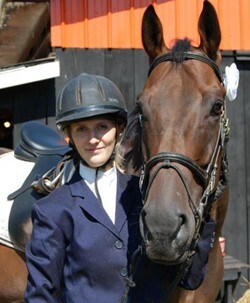 In addition to full days of classes including riding, training, teaching, equine massage, equine business, showing and riding theory, I spent my free time being a groom for staff members in exchange for weekend lessons and I would cover feeding shifts or water arenas in exchange for a little pocket money. During the holidays while everyone left for home, I stayed behind feeding 150 horses three times a day and bucketing freezing water in more snow than I had ever imagined in a lifetime - did I mention I was a California girl?! I graduated with a Riding Master III, Equine Massage Therapy Certification and Training Certification. I had perfect attendance and straight A's. One week after I graduated, on my 21st birthday, I was on a flight to Belgium for a job working with a four-time Olympic rider on the Belgium Olympic team as a groom and working student. 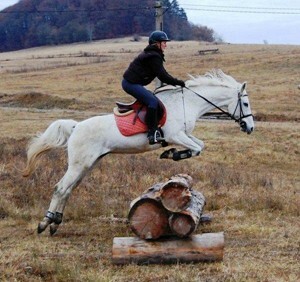 I have always been passionate about horses and I follow my dreams and pursue my goals boldly. 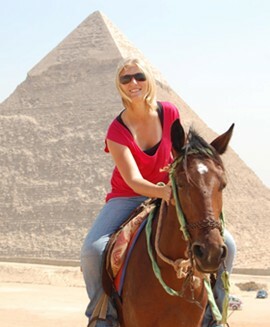 In 2011, I spent the year working in Egypt at a riding stable and show jumping facility just on the outskirts of Cairo. I departed for my journey on the day the revolution against Mubarak started in Egypt so I was instantly amidst an adventure unlike any other. Following Egypt I worked at two different FEI Level stables in Romania—one being a 10 Million Euro facility where I got to compete for the first time in an international competition on two different horses. I also worked in Sicily, Italy for a Grand Prix show jumping rider and am currently working in New Delhi, India. I have worked with horses in six countries and four continents, all at professional Olympic or top level show jumping and eventing stables. I am now 23 years old and although I have not yet reached my dream of riding in the Olympics, I am thankful for the opportunities that I have created for myself in pursuit of my dreams. And no one tells me to “get a REAL job” anymore! If you are interested in Krystal Kelly for clinics, lessons or presentations, please send her a message at krystalkelly009@yahoo.com. Keep track of her travels and current riding videos on her YouTube channel and follow her on Facebook or visit her websites www.krystal-kelly.com and www.kryskolumbustravel.com.